I have followed this step by step guide by iFixit. It included all the steps to help you open the Mac mini A1283. You will need a “putty knife”, you can get that from SACO hardware store. It is better to not buy the RAM from Apple. Instead I highly recommend Other World Computing. 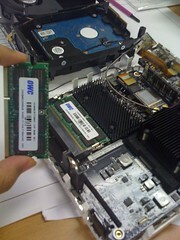 I bought 4GB DDR3 upgrade for the Mac mini A1283 for $64! They ship internationally so you can either have it shipped directly to Saudi Arabia or use myus/Aramex.